While it's been hot this summer you wouldn't be able to tell from slumping electricity grid demand (courtesy of a pleasingly large takeup of solar PV in recent years) and probably helped along by the government's efforts to push solar hot water and roof insulation a couple of years ago- Summer on the NEM: What the extreme heat didn’t do to demand. With a run of recent summers of below par temperatures, energy pundits have been eagerly awaiting a good summer heat wave to see just how our electricity system would stand up. The big question was what would happen when all those newly installed air conditioners finally got ramped up, once the the la Nina cycle broke and we got a good roasting? Would a return to hotter conditions finally break the trend of declining energy demand over the last four or five years? Well it looks like we got the summer that would answer these questions, and the answers are no doubt causing a fair bit of head scratching amongst the pundits. Since the last hot summer in 2010, our electricity system has seen a lot of changes. For one thing, almost 2 gigawatts of distributed generation has been added in the form of domestic solar PV. 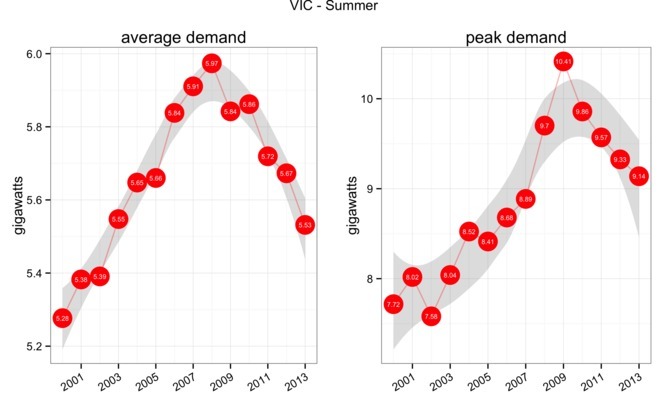 To put that in context, 2GW represents a touch under 10 per cent of average summer demand, though of course solar PV only produces at near maximum levels for a few hours in the middle of a sunny summer day. However, when solar PV is producing it takes away from the demand for electricity that otherwise would be dispatched across the poles and wires via our National Electricity Market – or NEM. So with this summer just past setting new records for extreme heat, it’s a good time to point the summer sun on the NEM and see how it is standing up. With blistering summer heat, particularly across New South Wales and Queensland, there was an expectation we might see new records in peak demand. But despite the weather and the supposed new air-conditioning load, the NEM doesn’t seem to have been pushed very hard at all during this last summer.